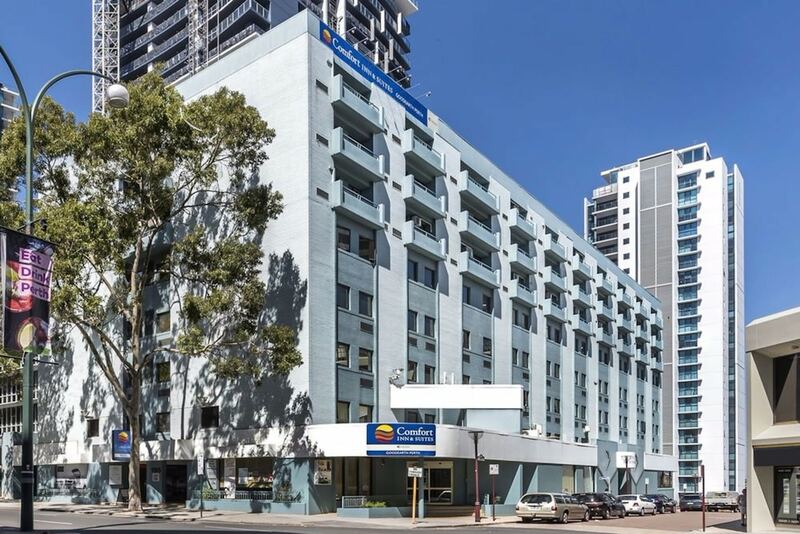 Comfort Inn & Suites Goodearth Perth - formerly Goodearth is centrally located in East Perth, a 5-minute walk from Perth Mint and a 4-minute drive from WACA. This spa hotel is 1.9 mi (3.1 km) from SCITECH Discovery Centre and 2 mi (3.2 km) from Kings Park War Memorial. Make yourself at home in one of the 180 air-conditioned rooms featuring kitchens. LCD televisions with cable programming provide entertainment, while complimentary wireless Internet access keeps you connected. Conveniences include desks and complimentary newspapers, and housekeeping is provided daily. Relax and unwind with massages and body treatments. Additional amenities at this hotel include complimentary wireless Internet access, a hair salon, and tour/ticket assistance. You can enjoy a meal at Adelaides on the Terrace serving the guests of Comfort Inn & Suites Goodearth Perth - formerly Goodearth, or stop in at the snack bar/deli. Quench your thirst with your favorite drink at the bar/lounge. Buffet breakfasts are available daily from 6:30 AM to 9 AM for a fee.